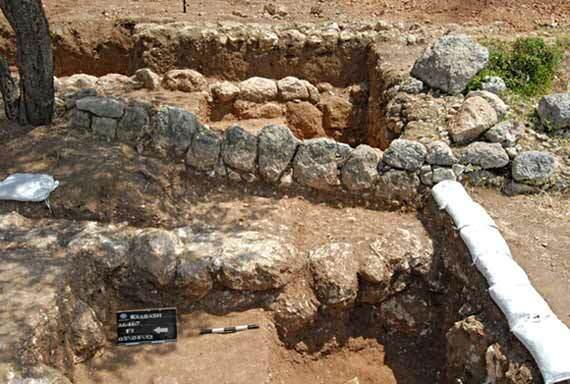 During March–April 2012, a salvage excavation was conducted in Ramat Bet Shemesh (Permit No. A-6467; map ref. 199437–902/623854–982), prior to construction. 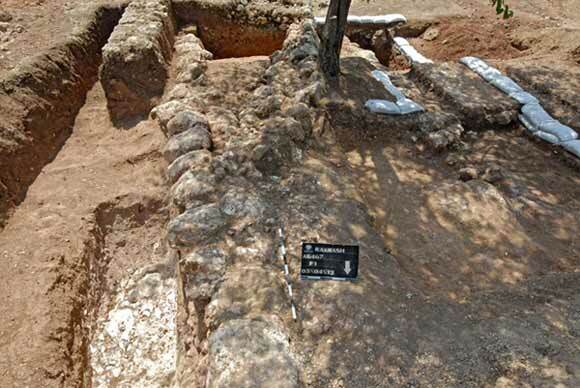 The excavation, undertaken on behalf of the Israel Antiquities Authority and underwritten by the Ministry of Housing and Construction, was directed by. I. Zilberbod, with the assistance of N. Nehama (administration), M. Kahan, R. Mishayev and E. Belashov (surveying and drafting) and A. Peretz (field photography). Four excavation squares (F1–F4) were opened c. 250 m west of the Nahal Yarmut channel (Figs. 1, 2); sections of roads (Areas F1, F2), small installations (Areas F3, F4) and a stone clearance heap were exposed. F1 (Fig. 3). 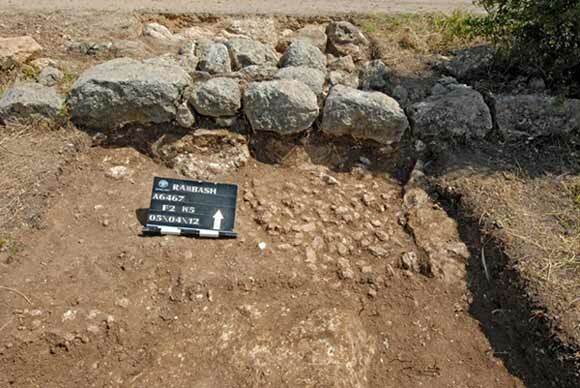 On the surface in the east of the area were the curbstones of a road (width 3.5–4.0 m; Figs. 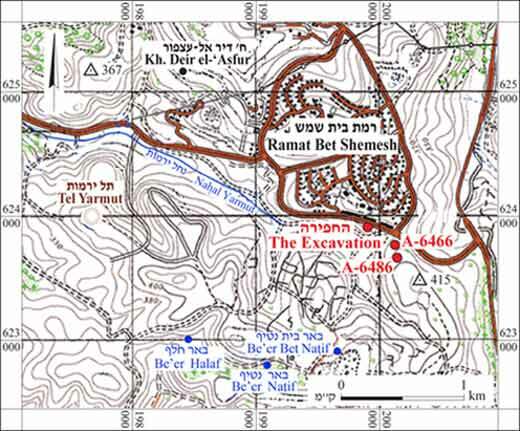 4–7), which crossed the channel in a north–south direction (length c. 100 m) and apparently led to a well that was documented in the Survey of Ramat Bet Shemesh (IAA Reports 46:244–245, Site 309.1). Three construction phases were discerned in the northern part of the road, along a distance of c. 10 m. In the early phase, the road (width c. 4 m) was delimited by walls built of a row of large fieldstones founded on the bedrock (W3—length 9.0 m, width c. 0.5 m, preserved height 1.2 m; W4—length 6.5 m, width c. 0.5 m, preserved height 1.5 m). Between the walls was a layer of small stones (height c. 1 m) and between them yellow-brown soil that contained potsherds from the Early Roman period (L15). 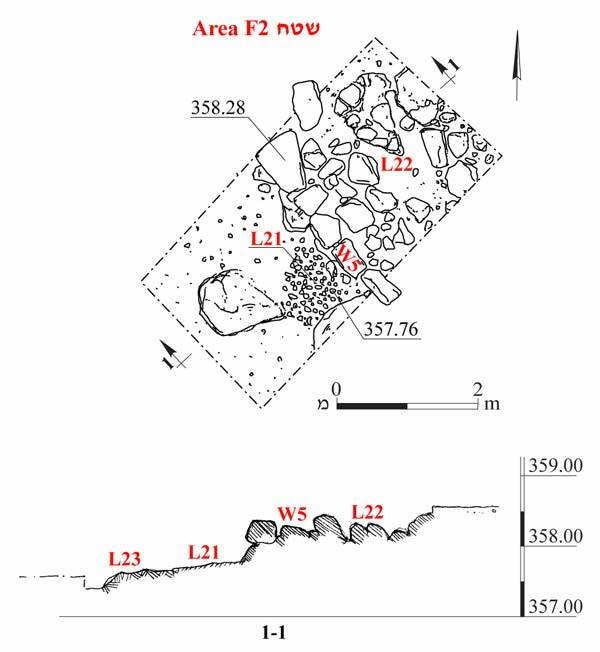 Collapse of large stones L18) was discovered west of W4. The wall apparently fell at the time it was being used and repairs were made to it. A new wall, c. 0.5 m to its east (W1/1; exposed length c. 5 m, width c. 0.5 m, preserved height 0.5 m), was built; it was abutted by a stone pavement (L14; height c. 0.15 m) that was placed on top of the earlier layer. Several Early Roman potsherds were discovered inside the wall. It seems that the two early phases of the road date to the Early Roman period. A layer of soil indicates that the early road was abandoned; it is unclear when and why this occurred. In the third phase, the road was delimited by two rows of medium-sized fieldstones that protruded c. 0.5 m above the surface. The western wall (W1/2; exposed length c. 21 m, width c. 1 m, preserved height 0.5 m), built on top of W1/1, was made slightly wider and its northern part curved to the east. The eastern wall (W2; exposed length c. 21 m, width c. 0.8 m, preserved height 0.25 m) consisted of a single course just to the east of W3. A layer of small stones (L12; height c. 0.1 m) was exposed between the walls and below the layer were worn potsherds from the Byzantine and Ottoman periods. 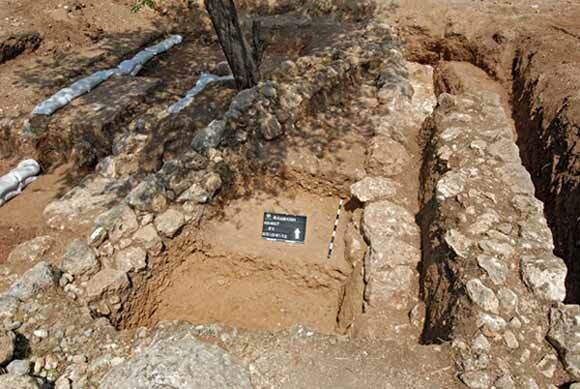 A layer of soil (thickness c. 0.5 m) was discovered between Layer 12 and Floor 14. F2 (Figs. 8, 9). 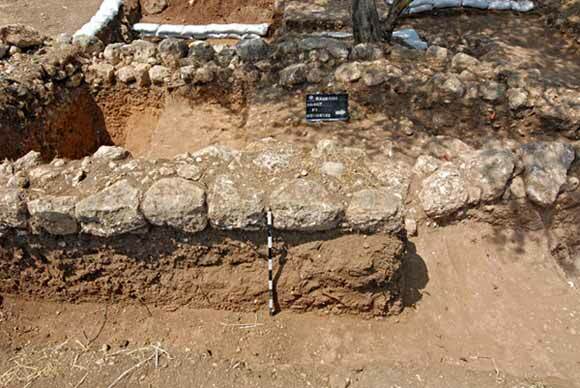 A field wall was discerned west of Area F1 and perpendicular to the road. A road aligned east–west (preserved length c. 150 m) was exposed in a trial trench. The road was paved on the slope and its bottom was leveled by means of retaining wall. Its foundation was a layer of tamped soil fill above a natural bedrock terrace and it was bounded on the south by a wall (W5), set on the bedrock and built of large fieldstones and fill of soil and small fieldstones in between. The top of the wall protruded from the surface and enclosed the road (max. height 0.5 m). The wall enclosing the road from the north was not discovered and no datable artifacts were found. The connection between the two roads is unclear. 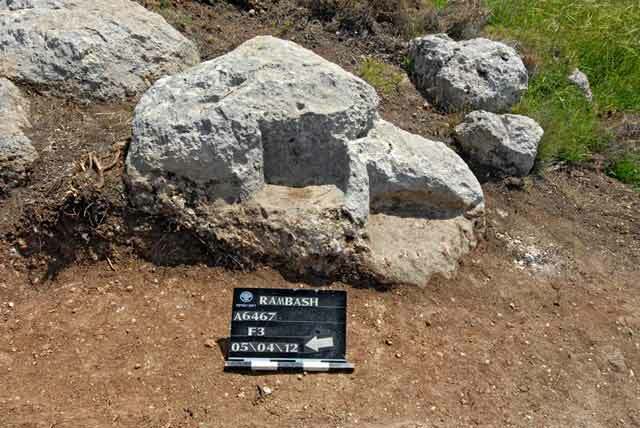 Part of an installation, not in situ, was found north of the road (Fig. 10). 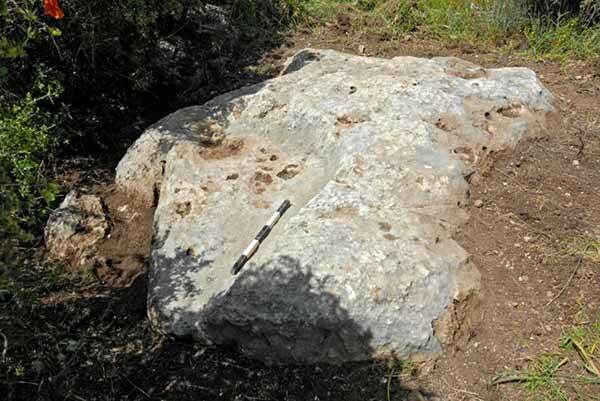 It consisted of a large stone that had two rock-cut lines (L24; c. 0.7×1.0 m) along its edge. F3 (Figs. 11, 12). 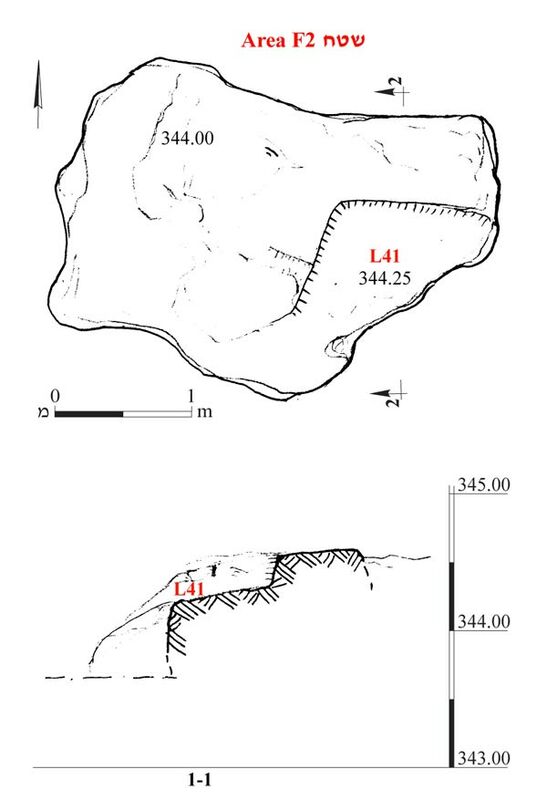 Two adjacent rock-hewn installations, a northern (L32; c. 0.4×0.5×1.0 m) and a southern (L33; 0.5×1.0×1.0 m), were exposed. A trial square was excavated west of them and no finds were discovered. F4 (Figs. 13, 14). A triangular rock-hewn installation (L41; 0.5×1.0×1.0 m) located c. 100 m west of Area F3. No finds were discovered. 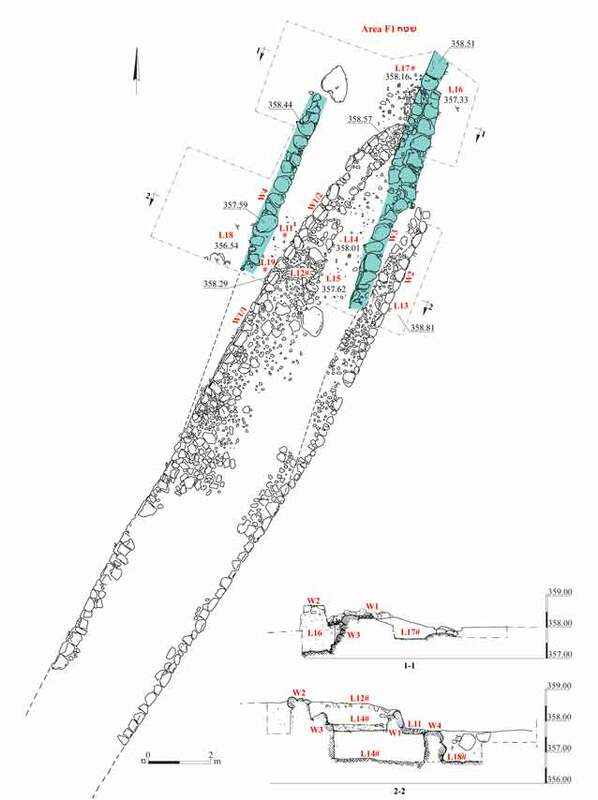 Mechanical equipment was used to excavate a modern stone clearance heap located c. 200 m northwest of Area F4. No finds were discovered. 3. F1, plan and sections. 4. F1, general view, looking north. 5. F1, general view, looking south. 8. F2, road, plan and section. 9. F2, road, looking north. 10. 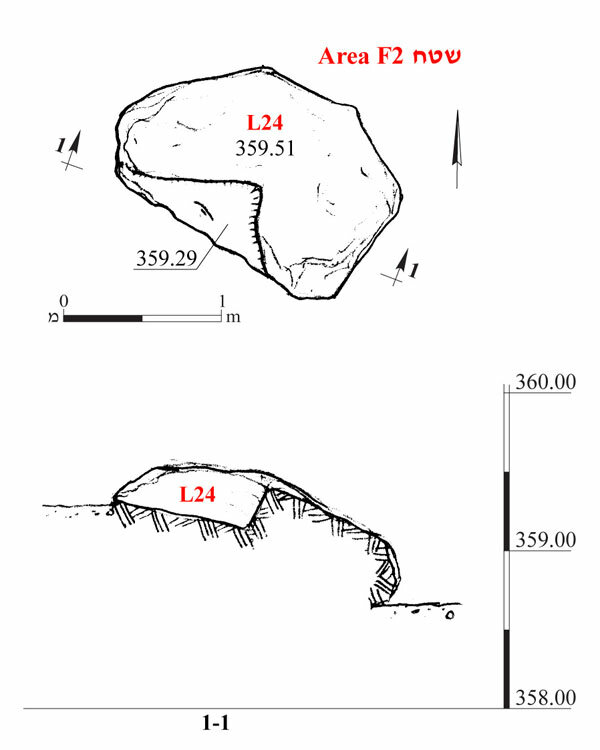 F2, rock-hewn installation, plan and section. 11. 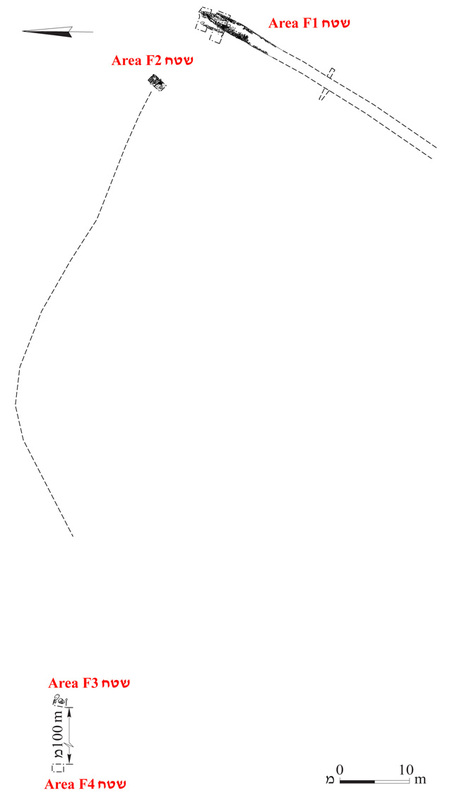 F3, rock-hewn installation, plan and section. 12. F3, rock-hewn installation, looking east. 13. 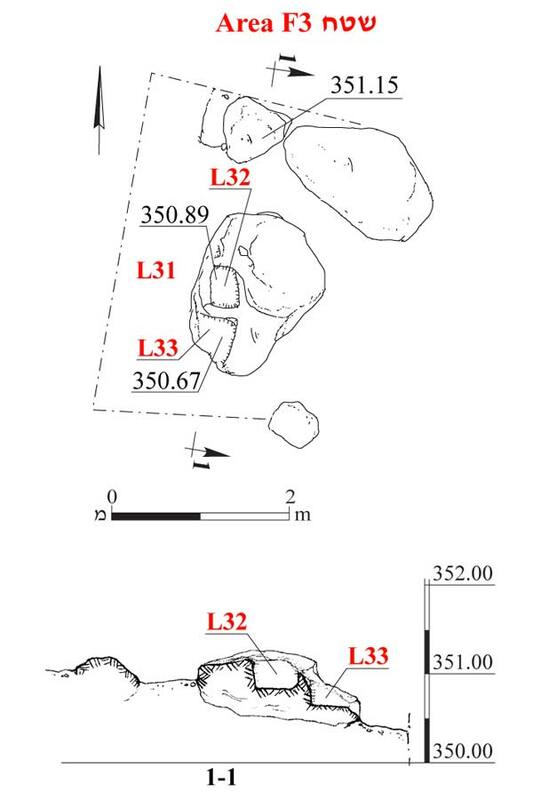 F4, rock-hewn installation, plan and section. 14. F4, rock-hewn installation, looking west.